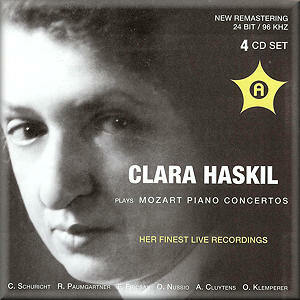 The Romanian pianist Clara Haskil died in Brussels in 1960. The studio recordings made in the last fifteen or so years of her life are justly revered, and fortunately have been available in a variety of forms and formats since then, but the present set is entirely of live recordings, all but one of music by Mozart, and in the case of two of the Concertos in alternative versions. As many of these pieces were amongst her commercial recordings, which in general are far superior in recorded sound and balance, clearly what we have here is something more likely to appeal to the specialist collector than to anyone simply wanting recordings of these Mozart Concertos. That is perhaps a pity, as what we have here is an object lesson in one very successful way of approaching those works. They demonstrate that perfection of ensemble, and realism and clarity of recorded sound are certainly desirable qualities but are by no means the most important things to seek in a recorded performance. In K595 in B flat (No. 27), for instance, two performances are included. Inevitably the soloist's overall approach is similar, but what is obvious is that each occasion - each combination of orchestra, conductor and hall - produces individual results. The performance conducted by Klemperer is the more obviously dramatic of the two, with the less legato from the orchestra, and with contrasts in mood and phrasing pointed more obviously, but both are worth hearing despite the poor recording quality, especially in the Klemperer version. They demonstrate not only the spontaneity of Haskil's live performances but how the work itself gains from such an approach. Although the sheer perfection of the music does necessitate careful preparation and consideration of every bar and every note, the result should never be such as to strike the listener as precious or contrived. I am sure that the preliminary work put in by Clara Haskil was considerable, and of course by the time of these recordings she had been playing this music for many years, but none of this is apparent to the listener. On the contrary it is the freshness and the joy of the performer in the music that is what we hear again and again. This applies throughout these discs. Even the weaker performances are worth hearing. The first movement of K488 in A major (No. 23) for instance starts with a somewhat routine performance of the opening tutti, but things soon improve with real interaction occurring between soloist and orchestra, and in the last two movements the orchestra have clearly been galvanized into much better playing - although the bassoonist can barely hang on in the last movement at the fast tempo adopted initially. Again the recording is poor but I found I had no difficulty in adjusting to it very quickly. The one doubtful inclusion is that of two separate performances of K459 in F major (No. 19), both conducted by Ferenc Fricsay with poorly recorded and sometimes out of tune orchestras. Even here, however, there is much to enjoy, especially in the cadenzas. Unusually they are indeed a highlight throughout the set. In some ways the most exhilarating performance is that of K365 in E flat (No. 10), where Clara Haskil is joined by Geza Anda as the second soloist - although no indication is given of who plays which part. The sense of fun and of justifiable showing off is palpable, and the set would probably be worth having for it alone. The Sonatas with Arthur Grumiaux are similarly worth hearing for their delightful sense of partnership. Andromeda have perhaps not made the set as compelling for the listener as it might have been. There are no notes on the music, the performers or the occasions at which these performances were recorded. All we get is a bare list of works, performers and movements. Two of the Concertos are split between two discs, although this does enable the last disc to be filled with the Sonatas, which are no mere filler. Nonetheless, despite their obvious limitations, I had immense pleasure from listening to these performances. There is too much wrong with the recording and with much of the orchestral playing for them to be the sole representations of this music in any collection of the Mozart Concertos. They do however deserve a place as an important supplement to Haskil's or others' studio performances. They serve as a reminder of the way in which a very great interpreter of these works can bring a freshness to every new performance, and to the way in which, as a result, the works show themselves in a new light.